Social network giant, Facebook, has launched its Free Basics service in Nigeria, Africa’s most populous country—and its biggest market on the continent. The platform which allows users to access listed websites at no cost was launched in partnership with Airtel, the country’s third largest telecoms operator with almost 34 million subscribers. Free Basics is part of Facebook’s internet.org initiative which aims to provide internet access to the two-thirds of the world without it and the company says the project has helped bring 25 million people online globally. In Nigeria, where it has 16 million users, the high price of data remain an impediment to internet access despite growing smartphone penetration. The controversial free service has been criticized for its ”walled garden” version of the internet to users meaning they could only accept select websites on the service. But Facebook responded by opening up the platform to a wider range of sites which met “technical specifications.” While it has drawn the ire of net neutrality advocates globally, it has also faced stiff opposition from some national regulators. India effectively banned the service earlier this year despite intense lobbying from Facebook. The move was expected to spur critics of the service to seek similar bans in other countries but across Africa, the service has been largely welcome. In Tanzania, where internet penetration stands at only 5%, the country’s regulator said the possibility of increased ”adoption of data services” by Tanzanians was more beneficial to the market. Facebook says it will work with developers in Nigeria who can build sites with local content which will improve the platform’s relevance to the local audience. Already listed on Free Basics is Jobberman—Nigeria’s biggest jobs portal. In a post, Mark Zuckerberg said Facebook was eager to offer “the opportunity to access news, health information and services like Jobberman that were built by Nigerians” without having to pay. Facebook says it has been welcomed in Nigeria. At a developers forum in Lagos yesterday (May 10), Ime Archibong, director of global product partnerships at Facebook, said the service has been “embraced” in Nigeria as there is an “appetite” for solutions to tackle Nigeria’s “connectivity challenges”. These connectivity challenges are present across Africa. 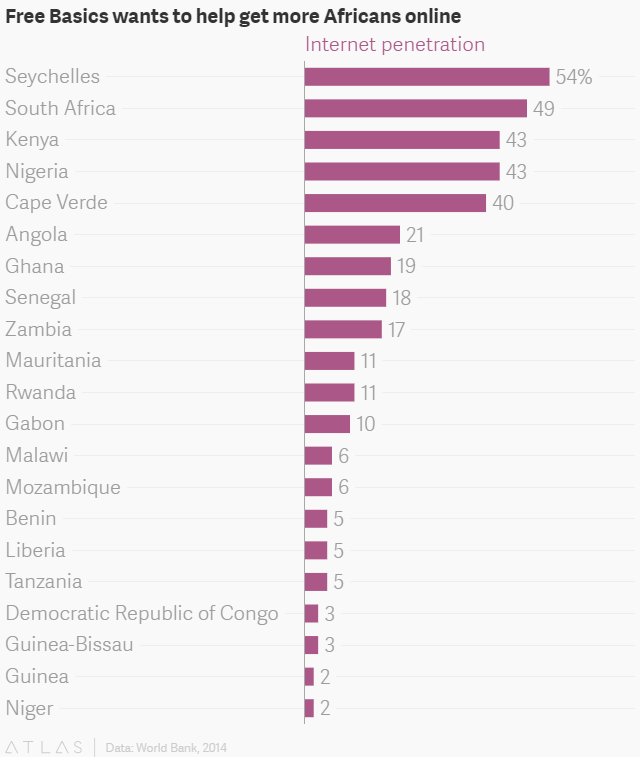 Of the 21 African countries where Free Basics has launched, only Seychelles has an internet penetration rate above 50%.